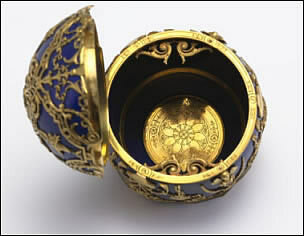 The 1912 Tsarevich Egg is made of gold, lapis lazuli, portrait diamonds and brilliant diamonds. The Frame surprise is made of platinum, lapis lazuli, rose-cut diamonds and watercolor on ivory. 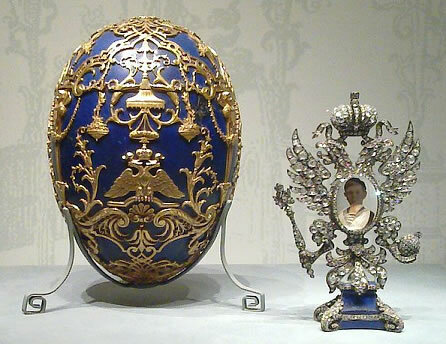 This Louis XV style Egg was carved from a superb block of lapis lazuli and ornamented with gold tracery of shells, scrolls, baskets of flowers, and cherubs. The crowned Imperial monogram AF (Alexandra Feodorovna) and the year 1912 are shown under a rectangular portrait diamond surmounting the Egg. A large brilliant diamond is set in the base. 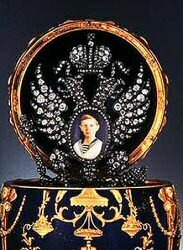 The surprise inside is the Russian double-headed Imperial eagle, covered front and back with 2000 diamonds, with a miniature portrait of the Tsarevich Alexei Nicholaevich on the eagle's chest. The reverse site of the miniature shows the back of the seven year old Alexei. It is assumed that the original painting was replaced by the present one to conserve the original. The hemophilia of their only son, (the Imperial family kept it secret from the Russian people) was an enormous blow to the Imperial couple and it influenced the last twelve years of the Tsar's reign. Alexandra would devote the rest of her life to protecting her son, clutching at any hope offered by anyone, including Grigorii Rasputin. In 1912, on vacation in Spala, Poland, the Tsarevich suffered a severe hemorrhage that almost killed him. Bulletins were issued about his state of health, without saying exactly what was the cause of the problem. The last Sacrament was administered and a notice announcing Alexei's death was prepared. The Empress Alexandra called on Rasputin who told her not to grieve: "the little one will not die". It was this crisis that brought Rasputin back to Imperial favor after a cooling down in the relationship after several prophecies from Rasputin failed to come true. Now he had unparalleled influence on the Tsarina. In 1930 one of the ten Eggs sold by the Antikvariat to the Hammer Galleries, New York. 1933 bought by Lillian Thomas Pratt. 1947 Collection of the late Lillian Thomas Pratt, willed to the Virginia Museum of Fine Arts, Richmond, United States. Update 2012: More and more I see the name of this Egg as "Tsesarevich Egg" in stead of "Tsarevich Egg". A Tsarevich is the son of a Tsar, a Tsesarevich is the heir to the Tsar. A Tsar can have many Tsareviches, but only one heir! 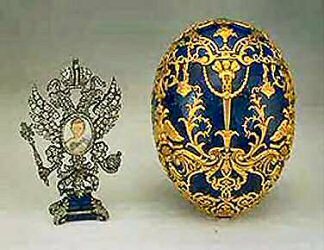 As Alexei was both a Tsarevich and the Tsesarevich, I guess both names are right, especially as the original invoice from Fabergé for this Egg has not been located yet. 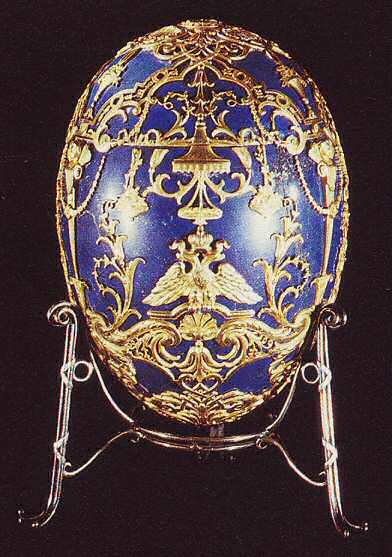 But as there was only one Tsarevich-Tsesarevich (Alexei) at the time this Egg was made, I go with the name Tsarevich. The two most important books an the Imperial Eggs, Fabergé/Skurlov/Proler 1997 and Lowes/McCanless 2001 both use the name "Tsarevich". More on this title in wiki. Update 2015. Much is written about the stand of this Egg as an archival photo is known of the Egg and its original stand. The original stand was most probably separated from the Egg during the years the Bolsheviks sold the Egg and Armand Hammer exhibited the Egg in the United States. (1)	When the museum received the egg it included a gilded-metal stand marked with “88” (916/1000 parts of silver, making “88” slightly below sterling in silver content) and two undecipherable marks. However, this was not its original stand (2). Continued. To read the whole article, click here. Update May 2016. And yes, the Egg was spotted on the Internet with yet another stand. This surely is an earlier version. But the Egg is beautiful, no matter what stand! VMFA Education is a webpage made by the museum to educate the public, with interesting info about this Egg. Here you are: Webpage. The image below is from that page! 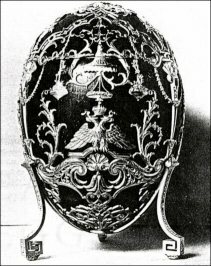 Several sources, including this page, state or stated, that Fabergé made this Egg to commemorate the "Spala crises" (described above under background information). As the Spala crises occurred in October 1912 (and not in 1911) and the Egg was presented in March 1912 this of course was not the case. That the Egg was made to commemorate the Tsarevich goes without doubt. Read all about this and the other four Imperial Easter Eggs housed in the Virginia Museum of Fine Arts on this new page! You can experience the Eggs in 360° and watch videos of the Eggs. When you download the App, (App Store or Google Play) you can read about the historic backrounds of the "key players", journey through a classic Russian fairytale and create virtual miniature egg charms! To watch the Egg and see the beautiful details by using the Zoom function, go to the Zoom functie on its VMFA webpagina by clicking here!